I don’t know about you, but if I knew the exact location of a treasure, I would already be hot on the trail. This isn’t the case for Dr. Diggabone, who might be the world’s laziest archeologist. Even with the prospect of endless riches dangling in his moustachioed face, the good doctor just can’t seem to find any motivation. In fact, he’s so lazy, that he won’t even move his own legs! That’s where you come in. It’s up to you to help Dr. Diggabone collect all the riches he can and escape a dangerous temple in Namco’s puzzle epic, “Lazy Raiders.” You’ll have to avoid traps, thieves, and other dangers as you make your way through each room, collecting any valuables you can. It’s not as easy as it sounds though. Remember what I said about Dr. Diggabone? You can’t move the doctor himself, since he’s so lazy. So how can you move someone who doesn’t want to be moved? By manipulating the world, of course. Lazy Raiders has you spinning and flipping each room, turning it in such a way that Dr. Diggabone slides down corridors and collects treasures. Remember those old puzzle games where you had to guide the metal marble through a maze, without letting it fall through the pre-cut holes? Namco’s newest title operates in the same way, but with the added difficulty factor of angry monsters, poisonous spikes, and sinister treasure marauders. There is a mass of content here, with over 60 levels (and hopefully more to come with future updates). Each level is more difficult than the last and some of them will really test your puzzle-solving skills. You’ll be able to control your surroundings in two ways, by either dragging and rotating the level itself, or turning and rotating your phone. The controls are very simple, and there is a very comprehensive tutorial that will have you up and running in no time. 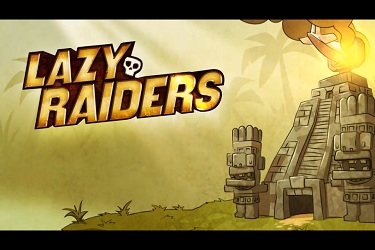 Lazy Raiders is available now in the App Store for only USD $0.99, a very small price to pay for such a unique and entertaining experience. The visuals are great, the sound is fun, and the gameplay is really addicting. 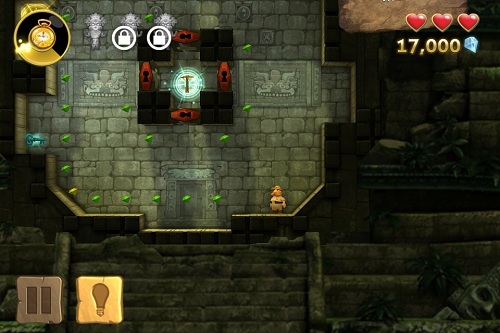 So be sure to grab this action-puzzle epic right now; don’t be “lazy” about it.